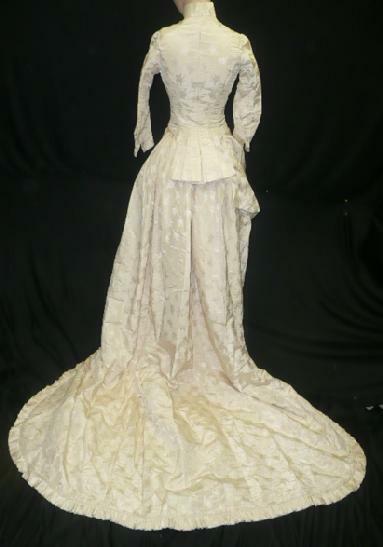 This auction is for a very very lovely original 1880s wedding dress/gown. 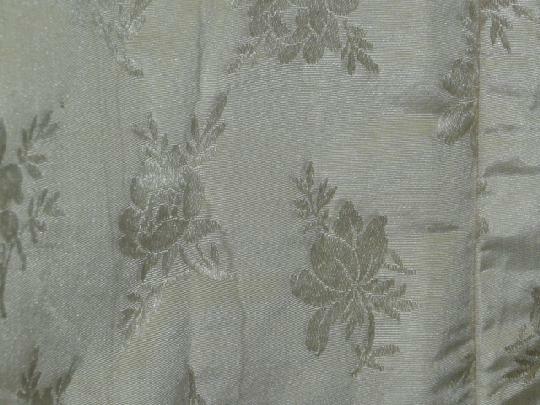 Definitely designed and created for the winter season, beautiful ivory on ivory silk floral brocade fabric. The bodice is lined and padded from the top of shoulders down into the chest and underarms. A wide mandarin collar, long sleeves with a triple flap cuffs and closure small ball silk ribbed faille covered buttons along with hidden hooks and eyes. The back has a split paneled short train that flows down over a simple slightly protruding bustle. The superb side closure skirt is designed with an attached billowy draping overskirt in the front while the back has the most stunning long train. 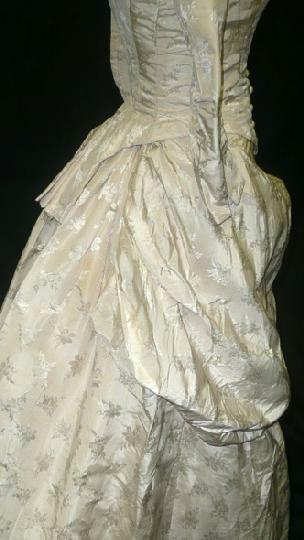 Wider back box pleats that wonderfully drape down over the bustle. The hemline is adorned with very interesting 4" wide box pleats, not just typical pleats but much more detailed and much more opulent. And of course, the gorgeous very long wide flowing train that is also adorned with matching to the front pleats. Fully lined with cotton flannel backing completely over the back of the skirt, I have never seen this in a formal gown. Fitting the size 2/4 mannequin with a very small amount of room left. Approx measurements - 34" bust, 24" waist, top of waistband to hem is 42" and back is 76" long. 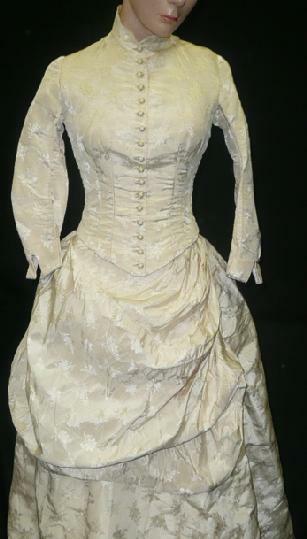 This gown is in the best condition I have ever seen in a gown of the era, no stains including none in the underarms. The fabric is quite sound and very clean, just absolutely stunning! I sincerely consider this one museum quality. Perfect if yo are looking for a wedding gown that will never be found on a store rack and superb for adding to a serious collection. Happy bidding!